Cancer – a diagnosis that strikes despair not only in the patient but the entire family. When a child is the one who has to cope with the disease, it seems so unfair and one cannot even begin to imagine what the parents, especially the mother, are going through. Add to that the burden of poverty which makes the situation even more unbearable. What these children need besides treatment is also adequate nutrition to help boost their immunity and combat the illness better. 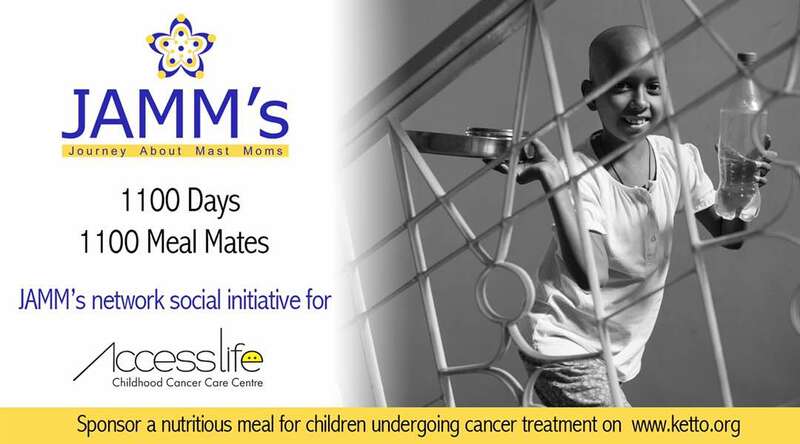 JAMM’s (Journey About Mast Moms) empathizes with what these families are facing; as mothers we can best understand the pain of another mother who is coping not only with a child battling cancer but also the sense of helplessness that pervades due to the lack finances. This is why JAMM’s network has collaborated with Accesslife (www.accesslife.org) to ensure that these children get their fighting chance and the necessary food nutrition through the initiative 1100 Meal Mate. 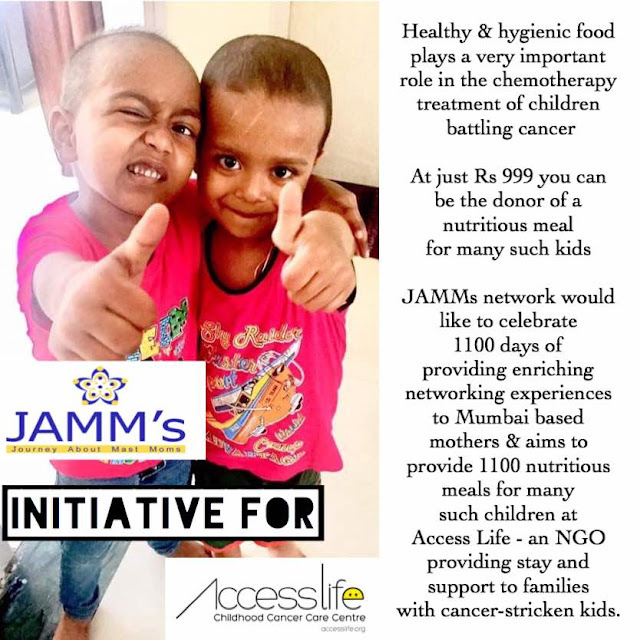 JAMM’s network will have been in existence for 1100 days and this initiative is a marker in its history of giving back to society. After all, mothers know about giving of oneself and bringing joy to others. Over 20,000 Moms from various areas connect and communicate online via what's app & a secret Facebook group + meet offline every month via their complimentary workshops, seminars and events which aid informed/conscious parenting decisions! Over 365 underprivileged kids received haircuts during JAMMs network first anniversary event - Happy New Hair. Over 550 needy visually impaired people received white canes & dark glasses during their 'i-light' social initiative. The 'Mast Santa' social campaign done in Dec 2015 donated unused handbags with goodies to homeless women. 'Step-Up' was their April 2016 social initiative where 730 underprivileged children received footwear and over 910 sarees were collected & donated to less fortunate women during their Nov 2016 social drive. Access Life Assistance Foundation provides a loving and temporary home for the parent or care taker and the child undergoing the treatment for cancer. Our mission is to offer a home-like environment for these families and we also try to improve the quality of life of these children by providing practical support services, educational resources and recreational programs. We understand the financial pressure cancer puts on some families so we provide them dignified accommodation at no cost while their child receives the treatment. In a country where care for the needy has long been accepted as dismal, Access Life is working to not only fill in a large unmet need but also to fundamentally change this mind-set.